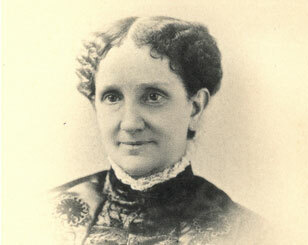 Mary Baker Eddy, the Discoverer of Christian Science and Founder of the Church of Christ, Scientist, was a deeply Christian woman and perpetual student of the Bible. The youngest of six children, she was born in 1821 to Congregationalist parents, Mark and Abigail Baker, in the small town of Bow, New Hampshire. The constraints imposed on most women of her time were compounded in her case by frequent bouts with ill health and the early loss of those most dear to her. Yet after her discovery of Christian Science in 1866, the limitations and failures yielded one by one through her absolute faith in and understanding of God’s goodness and love. By the age of twelve, Mary Baker knew by heart many of the Psalms and entire chapters of the New Testament. Daily Bible readings and family prayers were the rule in the Baker household. In addition to the profound influence of the Bible and of her devout parents, especially her mother, in her search to understand more of the nature of God, Mary found help from several ministers, to whom she later paid loving tribute. Although health problems sometimes kept her out of school, she was considered well educated compared with most young women of her day. Throughout the first half of Mary Baker’s life, her faith in God was sorely tested. Her marriage to George Washington Glover in 1843 ended after only six months with his sudden death. Mary returned to her parents’ home in New Hampshire and later gave birth to a son, whom she named after his father. The help that the young widow needed from her family in raising her child was not forthcoming after her mother’s passing in 1849, and because Mary’s health continued to decline, young George was eventually put into the hands of foster parents. She married Daniel Patterson, a dentist, in 1853, with the expectation that he would be able to provide a home for her son, but Dr. Patterson did not honor his promise to her in this regard. She was granted a divorce from him in 1873, after enduring many years of his infidelities. Various popular methods of treatment that she had employed for her physical ills between the 1840s and early 1860s had not provided permanent healing. In February 1866, she sustained severe injuries as a result of an accident and was not expected to recover. Several days later, however, she turned to one of Jesus’ healings in her beloved Bible. What she apprehended at that moment so illumined her thought with the conviction of God’s power and grace that she was healed instantaneously. As she herself later described it in her autobiography: “My immediate recovery from the effects of an injury caused by an accident, an injury that neither medicine nor surgery could reach, was the falling apple that led me to the discovery how to be well myself, and how to make others so” (Retrospection and Introspection, p. 24). While preparing Science and Health for publication, Mrs. Glover (as she was then known) was healing the sick. The cures brought about by her treatment through prayer were frequent, quick, and decisive. She later indicated that the cases she healed at this time included consumption, diphtheria, cancer, blindness, deafness, and lameness (see The First Church of Christ, Scientist, and Miscellany, p. 105). Mrs. Glover, while living in Lynn, Massachusetts, taught classes for those who wished to learn how to heal through prayer alone, in accordance with the method Jesus used. One of the most supportive of her students was Asa Gilbert Eddy, whom she married in 1877. The next year, with her husband at her side, she ventured beyond the confines of Lynn and began preaching in Boston. And in 1879, Mrs. Eddy and her students voted to organize “a church designed to commemorate the word and works of our Master [Christ Jesus], which should reinstate primitive Christianity and its lost element of healing” (Manual of The Mother Church, p. 17). After the passing on of her beloved “Gilbert” in 1882, Mrs. Eddy continued her nurturing of the fledgling Church of Christ, Scientist. As Christian Science attracted more notice and gained more converts, she increasingly faced criticism and even hostility from those who were offended by the uncompromisingly spiritual nature of her teachings. In line with the example set by Christ Jesus, she responded with love to even her harshest critics. She further counteracted malicious attacks by becoming more productive, continuing to write, teach, and preach in order to further elucidate Christian Science. She founded The Christian Science Journal in 1883, noting in the first issue of the publication that “the purpose of our paper is the desire of our heart, namely, to bring to many a household hearth health, happiness and increased power to be good, and to do good” (Vol. 1, No. 1, p. 2). This same unselfish purpose impelled all her work for humanity, and the fruits of her labor were plentiful and far-reaching. They included further revisions of Science and Health; the writing of numerous other books on Christian Science; completing the exacting work of organizing her church in Boston, as well as encouraging the establishment of Christian Science branch churches throughout the world; contributions to newspapers and journals of her day; and finally, in 1908, founding her own newspaper, the highly respected Christian Science Monitor. Mrs. Eddy passed away in 1910, in her ninetieth year. By that time, the Christian Science movement was beginning to encompass the world, and countless followers were experiencing in their individual lives the healing efficacy and redemptive power of this “new-old” religion – “the religion that Jesus taught and demonstrated,” as Mrs. Eddy characterized it (Miscellaneous Writings, p. 25). In her autobiography, Mary Baker Eddy explained what had inspired her lifework: “The motive of my earliest labors has never changed. It was to relieve the sufferings of humanity by a sanitary system that should include all moral and religious reform….From my very childhood I was impelled, by a hunger and thirst after divine things, – a desire for something higher and better than matter, and apart from it, – to seek diligently for the knowledge of God as the one great and ever-present relief from human woe” (Retrospection and Introspection, pp. 30, 31).